Here I’d like to tell you my story. Not because its a really special story, but because it tells you exactly who I am and what I do. And since you choose to visit my website I guess thats what you’re after right? I grew up in the middle of the Netherlands. Born in a town called Giessenburg and spend most of my years in the neighboring town called Noordeloos. Surrounded by flat green agricultural fields this part of the Netherlands could not be more typical Dutch landscape. Coming from a family of nature enthusiast, I was raised with passion for the outdoors and wildlife. This has formed the base of who I am now; a person with strong roots in the Netherlands and full of enthusiasm for the rest of the world, especially for nature and wildlife. But there is more! I wasn’t very old when I spend lots of time watching Jacques Cousteau. Becoming an underwater cameraman has been one of my biggest dreams during my youth. The underwater part changed for above the surface and I did become that filmmaker. Being able to work with film gives me the tools to record the stories I see around us in daily life and bring these stories to the general public. Wether this is a story about people, culture or about wildlife. It took me a while to realize filmmaking was the right thing for me. I started with working in audiovisual companies and theaters, but soon I got introduced to filming. At first just for myself but soon I realized this could be the tool I was looking for to tell the stories that were in my mind. So it was only a logic next step to studied filmmaking through the B.Design Audiovisual Media at the Utrecht School of Arts. Although I do often say its not the four years of studying that brought me the knowledge of how to tell stories using film, but its the four years of making mistakes while trying to make films, together with a group of people who are just as idiots about it as I am. During and after my study I’ve worked parttime at rental and postproduction company Het Raam where I’ve been working a lot in the technical camera department and in postproduction as a colorist. This has brought me a wide knowledge of workflows from the camera all the way to the end of the postproduction proces. And until today I’m this experience is most valuable almost daily in my work as a cameraman. From the first day of holding a camera I new this would be the way for me to combine my passion for the outdoors and wildlife with my love for film. Though I love to work on documentaries about people, culture or even architecture when I would need to choose I would choose wildlife. Over the past few years I have been delighted to find the perfect combination between the two in films about people and nature. Good examples are Once Upon a Tree and Wij en de Wolven. So for the past 8 years I’ve been working as a cameraman and filmmaker. I work for a variety of organisations either directly or via independent companies, including Vara, Avro, NCRV and National Geografic. Watching my portfolio you will see my work accompanies a huge variety of programmes. I believe no project is to small or too large. They all have their own challenges and rewards! Although this variety the last years the focus has been on wildlife film. The most interesting thing is that the demand for wildlife tv and film here in the Netherlands seems to grow rapidly. Our film The New Wilderness has been a huge succes in cinema and more than 700.000 people went to see it. And so two more cinema films followed and there are many more to follow I hope. 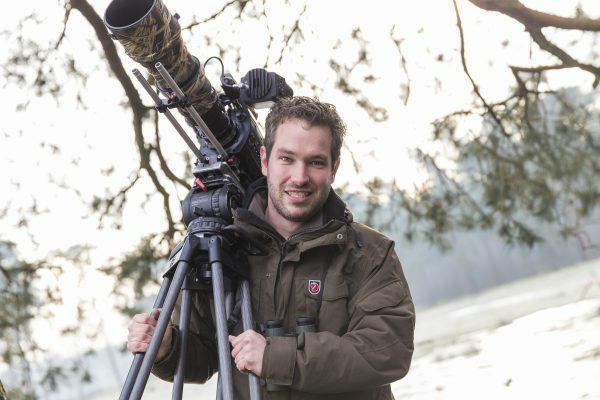 Next to these cinema productions I’ve also worked much for nature television like Vara’s Vroege Vogels where I worked as their principle wildlife cameraman. Through all this I’ve seen much of the wild side of the Netherlands in the past 5 years, filming everything from ants, ticks and woodlice to wild boar, seals and eagles. The list of species I’ve filmed for them, only in the Netherlands, is growing huge! I mostly work as a cameraman, but I’m capable of directing too. Expecially in wildlife filmmaking, where there is no director sitting next to you, I’ve been able to devellop myself more and more in this. This helps me much in very different situation, like for example when National Geographic hired me to shoot interviews in the Netherlands where sending a crew or only producer/director from South Africa would be to expensive. I like to see myself not as a shooting director but more as a directing shooter! Over the years I’ve used many different techniques from which I still regularly use. These, sometimes unconventional, techniques give me the ability to tell stories that I couldn’t tell without. For example I enjoy using macro a lot, for there are many stories to tell in the natural world that is as small as a pinhead. But also filming slowmotion using high speed cameras or using specialist thermal cameras are both very much fun to do. These techniques give us a way to tell stories that can’t told with a normal camera. Just a quick (but not complete) summary of specialist techniques I’ve been using to film: Blue/Green screen, High Speed/Slow Motion, Macro/Studio, Night Filming with infrared lights, custom made camera traps, Open Water Diving, Studio & exterior day & night lighting, thermal Imaging and lots of time-lapse. I’ve always been pushing the limits of my equipment and still searching for new equipment that gives us the ability to show things that we haven’t seen before. I have much experience in filming worldwide. Having filmed and travelled in most of Europe and in the United States, but also various projects in Central America and Africa. I am based in the exact centre of the Netherlands, close to a variety of Dutch and German airports which makes travel very easy. I speak good English and know my way in German and Spanish and some French. I own quite a list of equipment including cameras, but I’m happy to work with every camera the production wants me to as no shoot is the same.I do have to say; much overlooked is the advantage of knowing my own kit thoroughly and easy to adjust with all bits and pieces I have gathered in my set. If you like, please ask me for a detailed equipment list for what kind of equipment I can bring. I hope I’ve been able to tell you more about who I am. Please take some time to expore my site. If you have any questions just contact me! Hours have past, waiting for this moment. Time forces me to make quick choices and the tention makes my heart beat faster. It's got to happen now as I know this will only happen once. The light, composition, everything is right, and I know, I feel, the camera is recording it... Pure magic!